I am in Quick Mode and added a dollar amount. Now I want to switch to Inventory Mode and select a few items from my list, but the toggle is greyed out. Why is that? Inventory mode and Quick Mode are mutually exclusive. You cannot have a mix of the 2 in the same order. If you need to add an ad-hoc item while in Inventory mode, you can do so by adding a Custom Item. Once you start your order in one mode, the toggle will be greyed out and not “switchable” to the other until the order is complete or cleared. How do I add Inventory items to an order? Tap on either Add Custom Item (if not in your inventory) or Add Inventory Item. Then either create a custom item or tap on the inventory items you want to add. Quantities for an inventory item can be changed by tapping the three dots to the right of the price. Then tap Add to Order. I added an item to inventory and set it up with a variable price. However, I do not see that item when I pull up inventory within the app. The app currently does not support variable priced or per unit priced items. 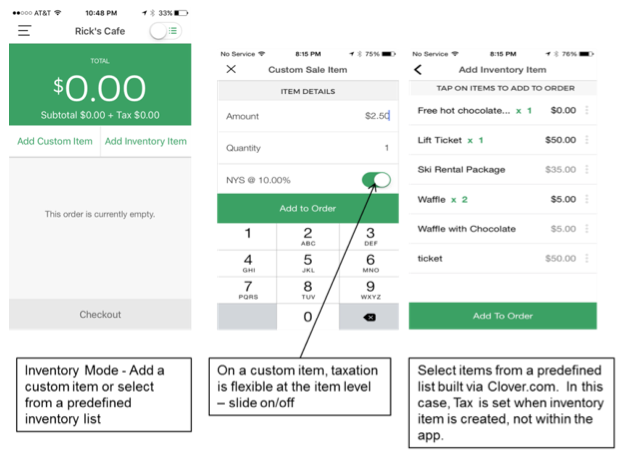 You will need to change it to Fixed price in order to see and select it within the Clover Go app. I have a huge inventory, how can I quickly find the item(s) I want to select? You can either use the search function by tapping the magnifying glass icon and then typing in your search OR You can switch to categories mode by tapping the three bar icon. Categories can be assigned to an item in the Inventory App on the Web Dashboard. When I enter a manual transaction and need to clear the contents I can clear the expiration date, but why is the card number is not clearing when I tap the back button? Because the card number is a separate field, you need to tap on the card number field before you can clear the card number. I tapped the credit card number, but now I want to go back and change the expiration date. How do I do that? You have to delete 1 character of the card number then add it back in and it will take you to the next field. I was entering my credit card number manually but the app did not let me enter the complete number. After a certain digit, it jumped to the expiration date field. What do I do? There are some cases where this can happen. To correct, please tap on the card number field and it will allow you to go back and complete entering the digits. In rare cases where it does not, the card reader should be used, if possible. I manually entered the card number, why do the digits display in red? This is an indication that the card number entered may not be valid. Please go back and re-enter the number to ensure that all digits were entered correctly. After I tap “Authorize”, why am I getting an error message notifying me of an Address Verification? This message is alerting you to the fact that the postal code or street address did not match. It is up to you whether you want to tap continue to process the transaction or cancel it and re-try the transaction or ask for a different form of payment. How can I allow my sales team to take payments on my behalf? Can I add them as users on my account? Login to your web dashboard at www.clover.com and select the Employees app. First Name and email address are required. All other fields are optional. Each employee added will receive an email from Clover with a link to verify their email and create a password. They will need to do that before they can activate the app. However, you will need to provide them with the instructions they need to download the app. You will also need to provide them with a card reader. I entered a Transaction Memo on the payment screen, where can I see it? You will see it on the report that you can export from clover.com/orders, but only if Notes is turned on. To do that, go to www.clover.com, click Setup app > Orders and ensure the “Allow Notes on Orders…” box is checked. If I accept a check as a payment option, do I still need to deposit that check? Is there a place where I can enter the check #? We do not have a separate field at this time, but you can use the memo field for that purpose. Can I control which payment options are displayed in the app? For example, if I do not want my employees to have the ability to record cash transactions, can I suppress that tender type? Yes. The Admin can log into their Web Dashboard at www.clover.com, click Setup app, select “Payments” and select or deselect “check” or “cash” as a tender type. Not all tender types apply to Clover Go only users at this time. I unchecked “Show in Register” for an item, why does the item still display in the app inventory? That feature of the Inventory app is not currently supported. I added modifier groups/variants/options to an item, so why don’t they display in the app? I added a signature option in the Payments section of setup, but why did it not reflect in the app? 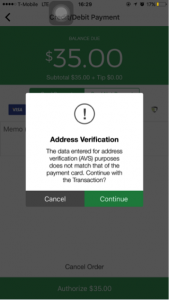 Not all features of the Clover Dashboard are available to Clover Go-only merchants and this is one such feature. I set up a service charge option in the Payments section of setup, but why did it not reflect in the app? I enabled the cash back option in the Payments section of setup, but why did it not reflect in the app? When I tap an item to add it to the order the app crashes. How do I fix this? Make sure the region setting in the device is set to United States. You can have any language setting you want, but the region must be set to the U.S.
How do I enable test mode on my Clover Mini or Clover Mobile?